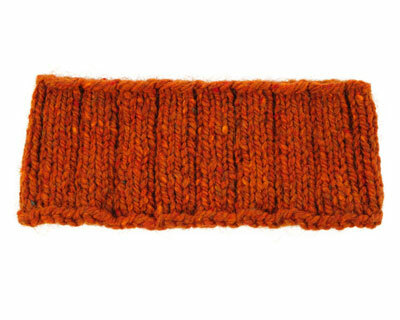 Simple, useful, and attractive, this headband is a great accessory for cold or cool weather. This project knits up quickly and easily. Make one for yourself; make a few for gifts. Match them with the fingerless mitts and keep your head and hands toasty all season long. In order to complete both projects in the same yarn, you will need about 125 yards of worsted-weight yarn. You can work this project with any of the four circular knitting techniques. It is so quick and easy that you may want to make four different ear warmers, each using a different technique. Use any worsted-weight yarn that is soft and comfortable next to your skin. When selecting a yarn, you may find it useful to hold the skein against your cheek or neck and check for any irritation; these areas are more sensitive than your hands. If you want this ear warmer to be extra warm, be sure to select a yarn with a high percentage of wool or alpaca. Cotton yarns can be very soft, but they are not as warm. Cast on 72 stitches and arrange your work on the needles according to the directions for your chosen knitting method. Join your work to knit in the round, being careful not to twist your cast on around the needles. Place a stitch marker to indicate the end of the round. *Knit 3, purl 1. Repeat from * to the end of the round. Repeat Step 2 until your work measures about 3 inches from the cast-on edge, approximately 18 rounds. Bind off loosely in pattern. Weave in yarn ends. Wash and block, if desired. Once your project is complete, you may wish to embellish the surface with embroidery in contrasting colors of yarn. You can knit this pattern in various types of ribbing, or you might want to experiment with stitch patterns such as cables or knit-and-purl combinations.